← Abraham ORCHARD, Thomas & Mary MILLS, Mrs Hannah MORE and Zachary MACAULEY all in one blog! From Orchards to Archards: coachmakers, pawnbrokers, local councillors and… Australians! William ORCHARD, one of my x4 great grandfathers, married Elizabeth HUNT on the 27th March 1780 at St Michael’s Church in Bath. 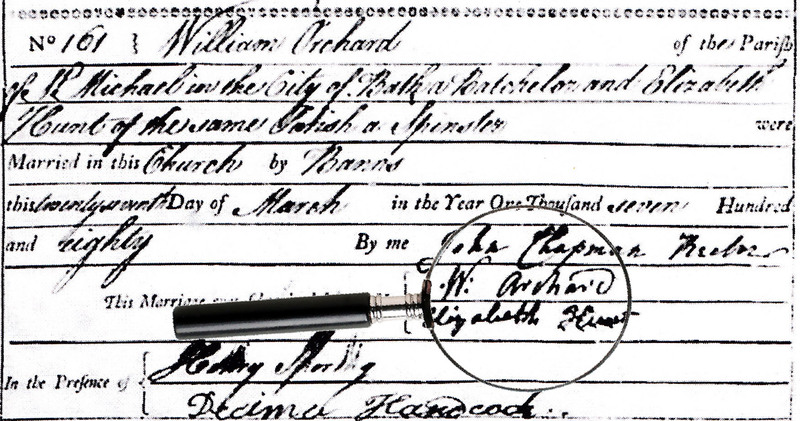 The parish clerk recorded William’s surname with an ‘O’ but the groom signed firmly with an ‘A’ and so my family were thereafter known as ARCHARDs. William and Elizabeth had at least nine children but, of these, I only know about my direct ancestor Charles (bp. 1790) and his brother Thomas (bp. 1786) in any detail. Thinking back to the last three blogs about Isaac and Abraham Orchard, their branch seemed to have had a family tradition of giving any boy called George a second name of no clear derivation e.g. not the mother’s or grandmother’s maiden names &c. In my family, this tradition appears to have been applied to boys called Thomas hence Charles’s older brother was baptised Thomas Wyate (or possibly ‘Wyatt’ since both forms have been recorded). Charles Archard died on the 11th November 1839 aged forty-eight years and so, unfortunately for me, he was naturally missing from the first useful English census in 1841. He did not appear in the few available early trade directories either. Curious as to his occupation and the reason for his early death, I bought a copy of his death certificate which rewarded me with both facts: he had died of consumption (tuberculosis) and had been a coachmaker. As a young chap, Charles had met a local lady with a wonderfully exotic name: Isabella STRANGE. They were married in the parish church of Lyncombe and Widcombe in October 1814 and baptised eight children there over a twenty year period; most of them survived to adulthood. Four sons, Charles, Thomas, Henry and William Strange (and some of their sons too) became coachmakers or coachsmiths. Incidentally, I discovered that the difference between a coachmaker (sometimes called a coachbuilder) and a coachsmith is that the former made the wooden parts, like the main frame and mouldings whilst the smith worked in metals, making the iron springs for example. The Bath Corporation (property) deeds archived at Somerset Record Office have been indexed and details can be found on their website. On the 21st May 1823, two plots of land and a messuage in The Dolemeads were transferred from James and Stephen BIGGS, yeomen from Lyncombe & Widcombe and an upholsterer, Alexander PRICHARD of Bath, to Thomas Wyate Archard of Bath, coachmaker. In the Bath Directory of 1826, ‘Thos Orchard, coachmaker’ was listed at 20 Monmouth Place. This may well be the same man, despite the apparent surname ‘relapse’. Perhaps there was an Archard coach-building business at some point but so far I’ve found no evidence of this in the local newspapers or other records. The Chapel on York Street dates back to about 1818 and was built on land originally owned by the Rt. Hon. Charles Herbert Pierrepoint, Earl Manvers. It is a lovely building, very near Bath Abbey, standing on what was originally the garden of Ralph Allen’s House. Commissioned as a Freemasons’ Hall, by the 1830’s it was allegedly a non-conformist chapel, although perhaps retaining its Masonic links. The 1830 Pigot’s Directory for Somerset briefly says that: ‘The Freemasons Hall is situated in York Street, near the Orange Grove, and is esteemed an elegant piece of Grecian architecture.’ In 1842, the building was used as a Baptist’s Bethesda Chapel and then was finally bought by the Quakers and used as a Friend’s Meeting House from 1866 to the present day. Possibly, Thomas Wyate Archard was a non-conformist and/or a Mason. James Edwards, a pawnbroker, was another of the fifteen lessees in the 1830 deed. The Somerset directory of that year shows that his business was at 14 Ladymead (Walcot Street). The births of his four children were recorded at Somerset Street Baptist Chapel. Thomas Wyate’s son, Thomas Dobney Archard, married James’s daughter Emma in 1836. Perhaps this is when Thomas became a pawnbroker and maybe even when he embraced non-conformism. In the 1841 census, Thomas Dobney was a coachman in London but by 1851, he too was in Bath and working with his father as a pawnbroker’s assistant, at which point the business became ‘Archard & Son’. Thomas Wyate’s wife Mary died at the age of sixty-eight in 1852 and then, rather surprisingly perhaps at the age of seventy-three, he married another of James Edward’s daughters, widow Eliza BLACKWELL, who was twenty-four years his junior. More bizarrely, had Thomas Dobney Archard’s wife Emma not also died in 1852, she would have become her older sister’s daughter-in-law! To recap: Thomas Wyate Archard started off as a coachmaker but moved into pawnbroking in about 1836-7, perhaps having married into the business as a young man. He had three wives but apparently only one child, a son Thomas Dobney Archard, who followed him into the pawnbroking business. The Archard and Edwards families would appear to be protestant non-conformists. Although coachmaking was probably quite a skilled trade, it doesn’t necessarily follow that it was a particularly lucrative one; Charles’s addresses in the poorer areas of Bath seem to reflect this I think. Pawnbroking, on the other hand, seemed to make a man rich because when customers redeemed their pledges, they paid back what they had been lent plus interest, so pawnbrokers were a little like bankers. Charles Dickens was particularly scathing about the trade plied in London but did go so far as to acknowledge that there were two classes of pawnshop and so I hope Thomas Archard kept a more respectable business as it would be distinctly uncomfortable to imagine my family profiteering from the poorer people of Bath! Thomas moved his establishment to 15 Bath Street in ~1848. This is a large building in a very prominent part of the city, perhaps surprising because some historians have suggested that such shops were poky little affairs secreted away in the back streets. 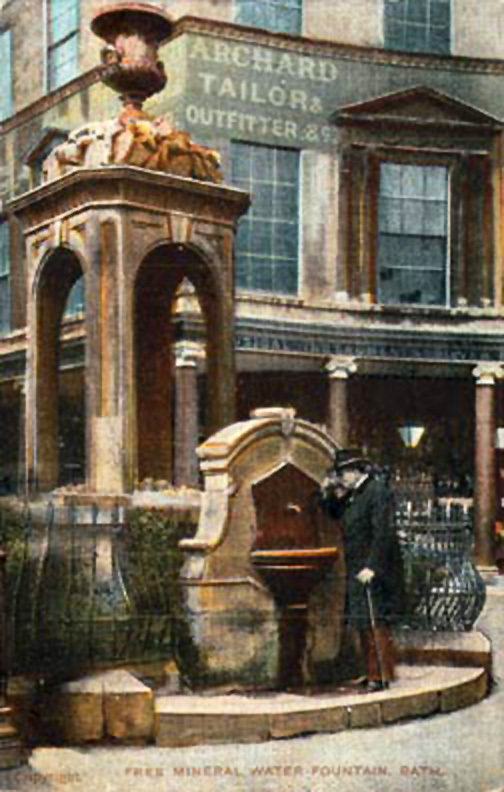 Number 15, seen in the postcard below, was an exception. 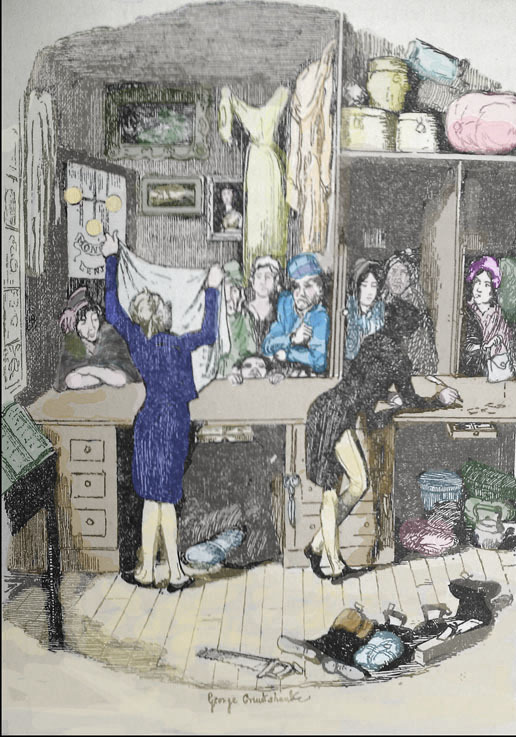 According to Dickens, the public area of a pawnbroker’s shop consisted of a wooden counter with some partitioned booths or boxes, presumably to afford customers a degree of privacy, if desired. One can imagine that people who’d fallen on hard times must have found a visit to the pawnbrokers a very embarrassing process and so it is also possible that Archard’s had a back entrance to spare the blushes of these poor unfortunates. Thomas was apparently a successful businessman and, on 4th February 1847, with 212 votes, he was elected as a local councillor for the ward of Lyncombe and Widcombe. He had taken part in council meetings before this time, the earliest report that I could find being in February 1841 when he spoke in favour of repealing the infamous Corn Laws. Rather usefully, the many newspaper reports of council proceedings give a flavour as to Thomas’s politics. For example, he was described as a Radical; he thought the Window Tax immoral, canvassed for affordable burials for the poor, was an abolitionist and believed in religious freedom. Interestingly, he helped to establish a public library in Bath which, until fairly recent times, was still in The Guildhall. The minutes of some council proceedings suggest that Thomas had quite a sharp wit which caused the members to laugh or applaud him on occasion. On the other hand, when Thomas Dobney also entered the political arena as a committee clerk, his father was accused of nepotism and the nature of their pawnbroking business unfortunately attracted criticism of their morals in some quarters! Nonetheless, Thomas had been elected an Alderman by 1862. One rather touching, if slightly amusing, article briefly reported on 12th March 1868, that ‘Alderman Archard, whilst on his velocipede, rode on the wrong side of the road and was run down by a laundry van. He was seriously cut to the head and rendered unconscious for fifteen minutes.’ I love the thought that, at the age of eighty-two, this old ancestor of mine was still riding out on his bicycle, albeit on the wrong side of the road! Not long after this incident and after decades of council service, Thomas retired and died at home, aged eighty-seven in 1874. I have grown rather fond of this outspoken, witty, non-conformist, sprightly, liberal minded man who was evidently still good marriage material in his seventies! I think he may have been rather nice and, I like to imagine, nothing like Dickens’s portrayal of the mean spirited, grasping pawnbroker. Thomas Dobney Archard followed in his father’s footsteps both as a pawnbroker and as a local councillor for Lyncombe and Widcombe. He was a Baptist and became very involved as an examiner for Bath Sunday Schools and was active in the Baptist Missionary Service. He married twice and had several children; his son Alfred continued the business after Thomas’s death in 1891 and expanded it to include tailoring, gentlemen’s outfitting and the sale of jewellery and children’s clothing. 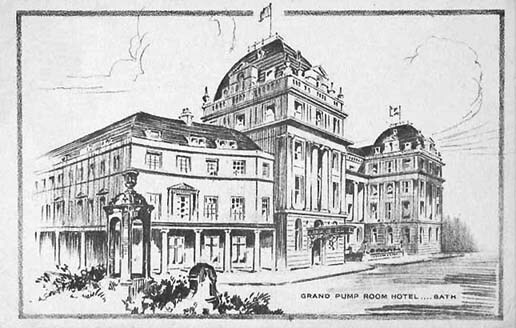 However, in 1905, Bath Street’s gigantic neighbour, the Grand Pump Room Hotel, proposed an extension to their premises that would swallow up many of the houses thereabouts, including number 15. Although the residents fought back, the plans went forward and by 1907 Archard’s was no more. Thomas George Archard: to Australia! Thomas George Archard, a son of Thomas Dobney Archard (1811-1891) and Emma Edwards (1814-1852), was born on the 12th January 1837 at 9 Sussex Street, Tottenham Court Road in London. 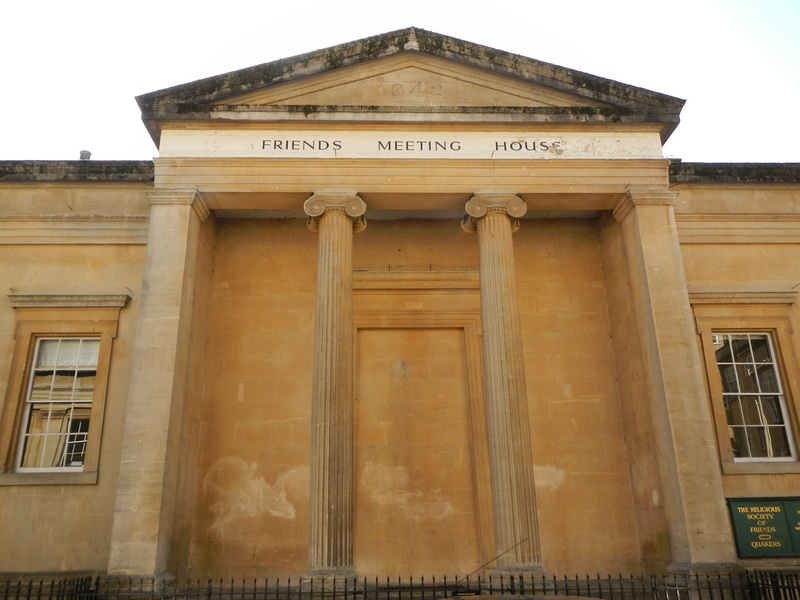 However, the birth was recorded at the Somerset Street Baptist Chapel in Bath (Thomas’s ancestral home). Thomas was variously a civil engineer, surveyor and iron merchant. He became the manager of Hawke’s Bros, Hardware Company in Beaufort, Victoria, Australia in 1882, having emigrated in about 1862. Thomas married Margaret REID (from Scotland) on the 3rd June 1863 in Melbourne. • Hettie Sarah Archard (1886-1969). Hettie was born in 1886 in Beaufort. She died in 1969 in Prahran, Victoria, Australia. Thomas George Archard died on the 5th February 1892 in Victoria, Australia. Administration was granted in London to John STONE and Benjamin Hicks WATTS solicitors the attorney of Margaret (widow) Effects: £625 5s 1d. Thomas was my second cousin (four times removed). I imagine that he has living descendants in Victoria today. If any one of them reads this, I would really love to hear from you! 18 Responses to From Orchards to Archards: coachmakers, pawnbrokers, local councillors and… Australians! My great great grand father George Henry Archard, Son of George Archard and Sarah Tibble, was born in Bath 24th june 1860. He came to Australia and married Ellen Hughes 1863-1930 and had 14 children. If you thikink there may be a link you can contact me. Iam am the great great grand daughter of Thomas George Archard. Great grand daughter of Frank Edward. Grand daughter of Norman. Please feel free to contact me. Karen, My question is about an “Alderman Archer” who, according to Bristol papers, was involved in a serious accident on March 9 1868 (a laundry cart crashed into his “velocipede.”) Can you confirm that this individual would have been Thomas Downey Archer? I am particularly interested in the vehicle. Do you have any idea what his “velocipede” was? if it was a bicycle (as opposed to a trickle or 4-wheeler) it is a very early example of a bicycle on the road. Many thanks for any clarification. I’m the grandaughter of Elizabeth Stuart Archard, (Bessie) who was Thomas George Archard’s dughter. She married Henry Ness and they had 3 daughters, Maggie, Nellie and Dorothy, my mother. I’ve traced the family tree back to Thomas Wyate and knew that he was a pawnbroker/outfitter but didn’t have all the details your blog has given me. I was fascinated to learn about his activities in Bath. He must have been an interesting man. I grew up in Melbourne but have lived in Canberra for the last 45 years. I thought Nan (Bessie) died in Melbourne although her daughter Nellie was living in Yarrawonga. My cousin Beryl (Nellie’s daughter ) still lives there. Thank you for the fascinating information about my forebears. I have another 2xGrandfather buried there also. Hi Linda…. hello! I’m sure that we must be (very) distantly related but can’t think how many times removed &c 🙂 Thanks for dropping by – I’m glad that you found the Archard/Orchard story of interest and by now you know just how far back the family’s history in Bath extends. I was very lucky to find so much interesting material! Hi My mother was an Archard from Hasting on the Hudson. My grandfather as well Most important Thomas Archard d, 1580 North Nibley England, was married to Margery Selwyne d 1595 was wondering if any one has information on them? Hi I have a tree on Archard of North Nibley perhaps you would like to contact me. I have found this blog very interesting. I have been trying to find more information on a deed I have been given. It is a land or building deed. My mother when my father passed. The land deed is between a Thomas Dobney Archard of Bath pawnbroker and Joseph Hill of same place and John Stone and John Giles Pilcher and Henry John Brown and Frederick Sanderson. My father purchased this in London to hang in his office as a decoration since he was a lawyer and thought it very interesting. This is a bit difficult to read but what I gather there are two dates mentioned in the deed March 5, 1870 and the August 6, 1867. A few places mention in the deed are Surry, Bath and N-11 Bellefields Terrace, Bellefields Road, V 85 Gracechurch Street, London. This deed appears to have the stamp Witherby Co, London with wax seals and signatures of those mentioned above. Any info would be great. Thank you!